Septins are an evolutionarily conserved group of GTP-binding and filament-forming proteins that were originally discovered in yeast. Once the preserve of a small band of yeast biologists, the field has grown rapidly in the past few years and now encompasses the whole of animal and fungal biology. Furthermore, septins are nowadays recognized to be involved in a variety of disease processes from neoplasia to neurodegenerative conditions. This book comprehensively examines the septin gene family and their proteins, providing those new to this research area with a detailed and wide ranging introduction to septin biology. It starts with a unique historical perspective on the development of the field, from its beginnings in the screen for cell division mutants by the Nobel Laureate Lee Hartwell. The evolution of the septin gene family then forms a basis for consideration of the biochemistry and functions of septins in yeast and other model organisms including C. elegans and Drosophila. 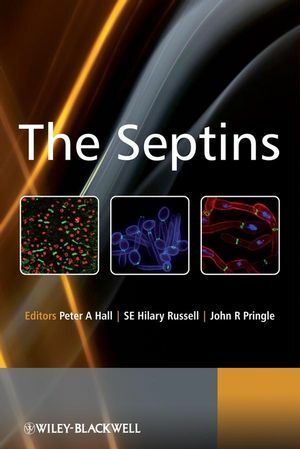 A major part of the book considers the diversity of septins in mammals, their functions and properties as well as their involvement in normal and abnormal cellular states, followed by a speculative overview from the editors of the key questions in septin research and of where the field may be headed. In addition, several appendices summarise important information for those in, or just entering, the field, e.g. nomenclature and septin and septin-like sequences. This book is an essential source of reference material for researchers in septin biology, cell biology, genetics and medicine, in particular pathology, including areas of neurobiology, oncology, infectious disease and developmental biology. SE Hilary Russell, Senior Lecturer in Oncology, Centre for Cancer Research and Cell Biology, Queen's University Belfast, Northern Ireland. Peter A. Hall, Musgrave Professor of Pathology & Consultant Pathologist, Queens University Department of Pathology & The Royal Hospitals Trust,?Belfast, Northern Ireland. John R. Pringle, Professor of Genetics, Stanford University Medical Center, CA, USA.